The tide of recordings by singer-songwriters shows no signs of abating -- a trend I think we can easily live with. The singer-songwriter format is generally a solitary one, though some such performers work with backing band. Far less common are groups of folkies working together, as was such a staple in the 1960s. Today, there are the long running Indigo Girls, and up-and-coming We're About 9, for example. There have been some occasional collaborative projects by trios or quartets of singer songwriters like Cry Cry Cry, The Four Bitchin' Babes, and more recently, Redwing. This week we have a fine new recording by a singer-songwriter trio who, like the folk groups of a generation ago, also emphasize tight three-part vocal harmonies. 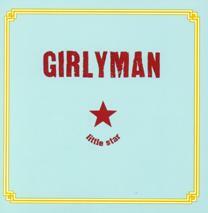 They call themselves Girlyman, and their new second CD is called Little Star. Formed in 2001 long before Arnold Schwartzenegger popularized the term in a political campaign, Girlyman apart from their music, does live up to its name with its members bending gender stereotypes. There's a woman Doris Muramatsu, a man, Nate Borosfky, who is partial to wearing lipstick, and Ty Greenstein, a person who sings alto, but uses the word "bi-gender" in the band's website as a self-description. But appearances aside, the trio creates some outstanding music that combines literate, though oblique lyrics with terrific three-part vocal harmonies, a penchant for writing music in waltz time, and very tasteful mostly acoustic backing. Muramatsu and Greenstein had been long time friends and roommates, and formed a duo in 1998 called The Garden Verge, based in New York. Borofsky had established a reputation as a singer-songwriter in the Boston area, but decided to come to New York. In looking for a place to live, Borofsky ended up sharing a Brooklyn apartment with Greenstein and Muramatsu, and it wasn't long before they started singing together. They scheduled their first formal rehearsal for September 11, 2001. Naturally that got put off, but the events eventually underscored their desire to get out and play music. They called themselves Girlyman they said, since they did not want to take themselves very seriously. Borofsky also says that the name "refers to our annoyance with traditional gender roles." They soon began to attract attention through appearances on the folk festival circuit, including the Falcon Ridge festival, where they won the "Most Wanted to Return" award. After they released their debut CD in the fall of 2003, their reputation was further widened. They toured with Indigo Girls, for whose record label, Daemon Records, Girlyman records. The new CD Little Star marks a step forward for an already worthy band, with the quality of their writing being exceptionally high with songs by all three, and their vocal harmonies becoming more seemingly effortless and reaching the point that they can sound like more than three voices. Each takes turns doing lead vocals, and the lead often changes within the course of a song. The are joined by a few additional players, including Julie Wolf, of Ani DiFranco's band on keyboards, the CD's co-producer Rob Harris on guitar, and Joe Dye on the subtle but frequently-heard steel guitar. Ty Greenstein of the trio plays most of the percussion. Girlymen say the songs on this CD as being about "love and war," which is a fair description, with lots of lovesongs, though usually in a more melancholy mode addressing unrequited love and separation. And there are a couple of songs having to do with war, soldiers and fighting. Little Star, the new second CD by the trio Girlyman is a fine album that combines three individually worthy singer-songwriters into a team that also features exceptionally fine vocal harmonies. They carry on and revitalize the coed folk vocal trio format that goes back to Peter Paul & Mary, though Girlyman's music is very much of the 21st century. There is not a throwaway track on the CD, and with lots of memorably attractive songs, though a bit of an explanation of the stories behind them might be helpful. Our grade for sound quality is a "B." The vocals are well-captured, but the recording, like so many these days, suffers from excessive volume compression, which squashes out the dynamics of the mainly acoustic performances. Girlyman's first CD has been getting a great deal of praise for their combination of high quality writing and outstanding musicianship. Their new CD Little Star shows that it was not a fluke. Girlyman has emerged as one of the bright lights on the new folk scene.